Financial Filing SystemsEliminate The Muda! Today’s post is from Mr Credit Card from www.askmrcreditcard.com. Though his site reviews credit cards, today, he is going to share how he organizes and files his financial statements. One of the most forgotten but important factors in keeping ahead of finances is organization. An unorganized person misses payments, loses receipts and has no idea which bills have or have not been paid. It may seem daunting, but this checklist may aid you in getting things in order and in the end, saving you some cash. 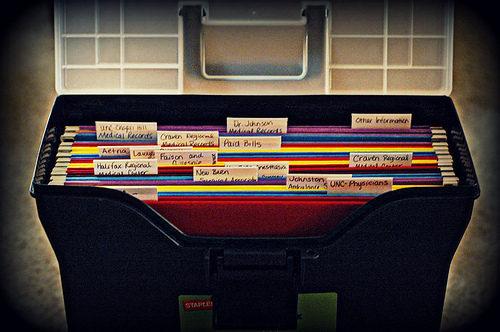 In this post, I am going to show you how I organize my files. But first, why even organize your files? Helps to make sure bills are paid on time. Aids in keeping proper and accurate records. Helps to track your monthly budget to assist in cutting excessive spending. Helps to track monthly bills and expenses that are used in filing taxes which can make year end filing a lot easier. Organize bills and statements by either due date or by interest rate, preferably highest to lowest to ensure that the highest interest rate is paid off quickly, thus saving you money. What Needs to Be Organized? Monthly Bil ls – utilities, cable, cell phone – I tend to lump under one file because these are bills that we pay every month. If it is all in one file, then filing it becomes much easier. I used to have separate files for each but they were really cumbersome. This works for me. My comcast, Verizon FIOS and AT&T bills go into this file. Mortgage, estate taxes and auto loan – This goes under a separate file from my utilities etc because these are loans that will eventually be paid off anyway. The thing I watch out for in the mortgage bill is the escrow account and I make sure that I keep the year end statement that list the annual interest that I have paid. This amount is tax deductible. The auto loan is just there so I do not have to set up a separate file. Presently, our mortgage is with Wells Fargo and the auto loan is with Toyota. Bank accounts – savings, checking, retirement – Next file is the bank account. I put all the statements in this file including Mrs Credit Cards’ statements. Presently, we bank with Bank of America, so there are just a couple of statements every month. The most important statement (all are important) is the annual statement that shows how much interest you have earned (reportable to the IRS). Credit Cards – I keep a separate file for all our credit card statements. They are important to keep in case there is any disputes. Presently, I use cash back credit cards (have two and have one for our business) and it is important for me to keep track of my rebates that I earn. Like all my other files, I keep the statements for 12 months and once the new year starts, I just file them away in a separate box and use the same file again for the following year. Medical File – While you could actually file this under the “insurance” file, I think a separate file for medical expenses, medical insurance policies make sense. This file is huge and complicated. But you really want to keep every receipt and statements here. Frequent Flyer accounts and memberships – You simply gotta keep track of all these miles and frequent flyer points you have accumulated because they have monetary value. You do not want them to lapse. Because I have flown so many airlines, and stayed in so many hotels, both Mrs Credit Card and myself are members of lots of programs! This is the file which we keep track of our points status from Starwood, Delta Skymiles, Virgin etc. Coupons, rebates file – This is a little coupon folder that Mrs Credit Card has. I keep my business finance totally separate from my personal finance files (just to keep them clean). But these are the files that I have. Payroll Records – We use paychex and this one requires a huge box since they send lots of statements! There are some things to keep in mind when organizing that will make the process even easier. For instance, I set up autopay to automatically pay bills from my bank account which helps to not only ensure that bills are paid on time, but it saves money in late fees and interest. I do, however, still receive the actual statements in the mail so I have something tangible for filing purposes. There are some areas like our webhost or internet services that simply do not send mail statements that I have to print them out myself. I mentioned a coupon and rebate file because whenever you have a rebate or a coupon, it helps to have it where you can find it quickly. What good is having a coupon if you can’t find it when you need it? It is also helpful to jot down information inside the folder such as contact numbers. This way when you need to give customer service a call, you can just grab the appropriate file. This is also where I note things like passwords, though some people may not be comfortable with that. Feel free to experiment and switch things around. Try out different filing systems, for instance and find things that work for you, personally. In the end, you’ll feel much better about having your personal finances all organized and in one place. You’ll find yourself saving tons of time looking for stuff as well as saving money and the frustration that is inevitable when you can’t find something. It may seem like a daunting task, but when organizing is completed, life is a lot less stressful. This is what I do and my methods. Please share you methods with us. Are those photos actual files from the system??? I’ve also seen a lot of articles on how LONG you should keep these files. If you’re continually stockpiling them, eventually you will end up on the show Hoarders. Along the lines of treating your finances like a business, you need to have an idea of what’s coming & going. .-= FinEngr´s last blog ..Maximizing Value, The Opposite of Earn More Spend Less =-. I really like how you organized your files into a portable case. That’s a good idea. I’m trying to cram my files into my desk drawer and am running out of room. .-= Litttle House´s last blog ..Wonderful Passive Income =-. Portable cases are great for filing systems, because when you really have to deal with all that crap and you’re running out of patience you can easily move to another room in the house and reboot! @FinEngr – The first photo is a CC picture from Flickr. The others do belong to AskMrCreditCard. Keeping old files is always a challenge. I’ve commonly see that 7 years is the max for most dead financial files. But with things like taxes the water is muddy. I was once advised by the IRS that if they feel the need they can ask for documents that are 20 years old! @LittleHouse – I can’t speak for AskMrCreditCard, but we keep all our old documents in those expanding file folder cases. They cost about $10-$15. In the last few years they have been getting tight but so far one is enough for each year. I tend to be a little conservative when it comes to financial documents. WE don’t keep receipts etc.. but I do keep all tax records, insurance contracts, deeds, mortgage papers etc. but just the key documents not all the disclaimer and legal crap. @Monevator – Great point! – Our old files go into the attic. We keep only the current and last two years close at hand. Little House – We do have a portable case just like the one above. It is used for business expenses. The dividers are split by month..So if the business buys anything from staples, microcenter, best buy etc, receipt goes there before it is organized properly. It is left on the desk so I can just get the receipts out of the wallet and just dump it in. I junk all grocery receipts and shopping receipts after a while! .-= Mr Credit Card´s last blog ..Using Credit Cards To Chase Delta Medallion Status =-. It’s funny, but a lot of people actually aren’t organized in this way. I’ve seen people with piles of papers. In fact, my brother in law and my brothers actually seem to believe that the best means of organizing anything is the pile (on the floor or any other horizontal surface). Yipes. I have my papers in a portable box too–it makes them easy to grab in an emergency–like in the fires we had when I lived in San Diego. @Simple in France- Too true. Admittedly, I’ve been there, but my organizing technique was a drawer to shove everything in. Organization was always a challenge, nothing worked until I found The 5S’. Wow life is so much better when organized!